A thoughtful, simple, melodic piece for unplugged fingerstyle acoustic guitar. The romantic recollections of an urban cowboy, alone at the end of the journey. No complications, no fancy packaging, just a nice piece of music. 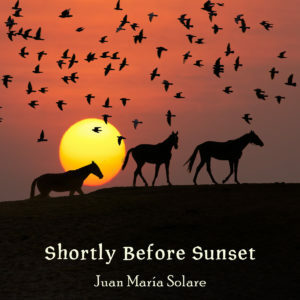 Shortly Before Sunset by Juan María Solare, released 09 November 2018 1. Shortly Before Sunset [Acoustic Guitar] 2. Shortly Before Sunset [Alternate Version] Shortly Before Sunset: A thoughtful, simple, melodic piece for unplugged fingerstyle acoustic guitar. The romantic recollections of an urban cowboy, alone at the end of the journey.